Through the years, well-known outdoor writer/photographer Steve Price has written more than a dozen top-selling books, ranging from bass fishing to nature photography and African wildlife. 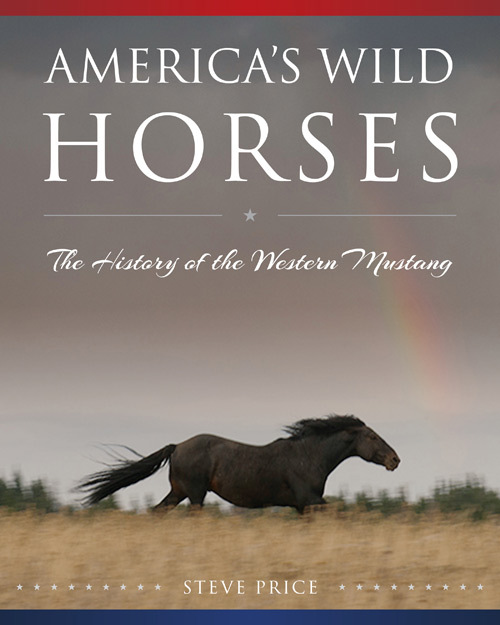 Now, editors and fans who have read the manuscript of his latest work, “America’s Wild Horses: The History of the Western Mustang,” are describing it as his best book to date. “Remarkable,” “compelling,” and “exquisite,” are just some of the early comments they’re giving to Steve’s detailed history of one of this nation’s iconic wild creatures, the Spanish Mustang. Beginning with the origin of wild horses in North America millions of years ago and following them up to the present time, this book is also a sweeping chronicle of the history of the West and how horses shaped that history. Chapters describe how the Conquistadors brought horses to North America and used them to conquer the Aztecs in Mexico, then moved into present-day New Mexico to establish permanent colonies in their continuing search for gold and silver. From there, Steve moves easily into the Native American cultures, particularly the Apaches and Comanches, and tells how these and other tribes helped spread horses throughout the Rocky Mountains. He details the roles played by the mountain men and traders, the early ranchers, and finally the United States Cavalry in continuing the spread of wild mustangs, then in totally eliminating the Indian horse culture. Throughout the book, Steve intertwines his research with both personal experiences as well as interviews he conducted with notable historians and horsemen, including not only with John Carson, great-grandson of mountain man and guide Kit Carson; but also with members of the Comanche tribe; DNA specialist Dr. Gus Cothran of Texas A&M University; and even legendary singer and songwriter Ian Tyson. The book is also filled with Steve’s beautiful wild horse photography from throughout the West. Regardless of whether you’re a horse lover or not, you’re sure to find “America’s Wild Horses” a page-turner from beginning to end. Although the book is not scheduled for release until April 18, 2017, advance orders are being accepted at Amazon.com. for $19.99 or $18.99 in Kindle. Specially inscribed and autographed copies will be available from Steve for $25 (including postage).